Only air has a more immediate importance to our survival than water. The human body is 60% - 70% water - indeed, we are more water than anything else is! Water is a combined filter, solvent, dispersant, and temperature regulator. Our body moisture is constantly being lost through evaporation, by breathing etc, and must therefore be replaced. Experts recommend we should drink about 6 cups of water a day. Water is important for circulation, weight control, blood pressure, kidney function and many other factors governing our health. However, this assumes that the water we consume is free from contamination by bacteria, excess salts, heavy metals, chemicals etc. IF IT IS NOT, THEN EVERY DROP OF WATER WE DRINK AND USE FOR COOKING INTRODUCES A HAZARD TO OUR WELL BEING AND REDUCES THE EFFECTIVENESS OF WATER BY INHIBITING ITS ABILITY TO ACT AS A COOLANT, FILTER, DISPERSANT, ETC. 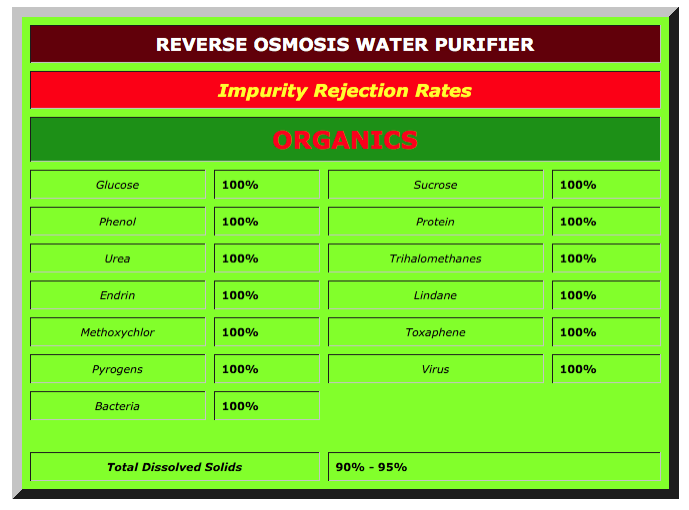 Reverse Osmosis is an adaptation of nature’s biological process. In the reverse osmosis process water is forced through a semi-permeable membrane that separates out the impurities and rejects them to the household drainage system. The R.O. membrane deals equally with bacteriological, chemical, organic and non-organic contamination. It will remove up to 98% of all pollutants. In humans, fluids pass in and out of such membranes (cell tissues) by the phenomenon known as osmosis, while plants absorb food and moisture from soil in the same way. Reverse osmosis is simply this natural process turned around. The Diamond Spring R.O. purification equipment is suitable for use on water supplies from mains water supplies which may be subject to pollution problems. Other consumers may be interested who suffer from specific medical conditions, e.g. kidney sufferers, for whom the equipment is strongly recommended. Reverse Osmosis (R.O.) is generally recognized as being the only really effective form of purification which can offer a solution to a wide range of problems, from the bacteria, excess salts and heavy metals which affect private water supplies, to the problems arising from industrial effluent and intensive farming which can pollute even municipal supplies. Diamond Spring R.O. purification combines reverse osmosis with two other forms of treatment. Firstly, the water passes through a dirt/sediment filter. This removes particles and protects the next stage, the R.O. membrane, helping to extend its serviceable life. Then the product water from the R.O. membrane passes through a granular activated carbon filter, which is particularly effective against organic chemicals, this guarantees that the water tastes good. Thus the three stage process is capable of dealing with any problem. The Diamond Spring R.O. purification equipment is guaranteed to meet EEC Directives on both maximum admissible concentrations and guide levels for pollutants in drinking water. Here are some results from the American Testing Institute of San Diego, California on R.O. membranes which show just how effective R.O. systems are. 1. How good are R.O. Systems? With the Reverse Osmosis method, all but about 5-10% of pollutants, (dependant on the type of membrane used and other parameters) even those that are dissolved in solution are extracted by the membrane and passed to household drainage system. 2. What does Diamond Spring R.O. Water taste like? Diamond Spring R.O. systems, using no chemicals or additives, produce clear polished water that tastes light and pleasant. It is what our customers comment on, when asked what they like most about their own water purification equipment. 3. What about the minerals in tap water? Independent medical advisers in the United Kingdom tell us that virtually all of the trace elements and minerals that we need can be supplied in a well balanced diet, and can not be found in a balanced and wholesome form in the water we drink from the tap. A naturally occurring mineral in water is calcium carbonate (CaCo2) which, if present in large quantities, will fur up your arteries as well as your kettle. We believe that the minerals in tap water are of little use, having been mixed up with the wide variety of pollutants now found in water supplies. We suggest a catalytic mineral concentrate in liquid form "Consentrace". 4. What makes Diamond Spring's R.O. system so different? a special pH balancing media in the form of a BioCeramic cartridge is used to overcome this problem. 5. Why is a granular activated carbon also included? 6. Will the system produce enough pure water? Yes, the standard R.O. system will produce 50 gallons of pure water each day, more than enough for the average family. Other larger models produce more and systems can be made to order that will produce up to 120 gallons. 7. Will it take up much space? 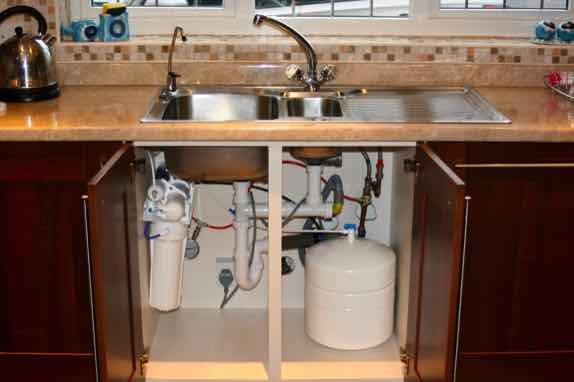 No, the undersink system measures just 45cm high, 33cm wide and 13cm deep. It will fit into most undersink or other kitchen cabinets without difficulty. The reservoir is 45cm high and 28cm diameter. 8. Will it need electricity? Not usually, unless the mains pressure is particularly low. Then a special booster pump is required and a power supply. 9. What is the 'auto shut valve' for? This is the pressure activated control valve that ensures the plant is automatically shut off when the reservoir is full. 10. What is a ‘flush valve’? This is a valve that is periodically opened to flush away any accumulated deposits and debris from the membrane. 11. What will it cost to run? The only running costs arise from the replacement of the two filters every six months. 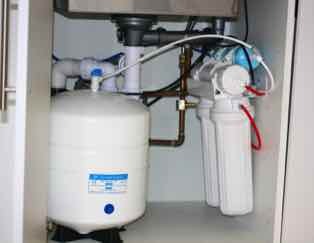 The reverse osmosis membrane will last approximately 4/6 years (more frequently if the feed water is of exceptionally poor quality, possibly less frequently if a water softener has been installed). The cost can be as low as £3.5 per week, or just 1 / 2 pence a gallon of pure water, depending on usage and location, surely very good value when you consider what is being achieved by the system. 12. How do I get the system installed? Your Diamond Spring Distributor will arrange the installation for you. This work will take approximately 1-2 hours, longer if there is exceptional plumbing work. Your Distributor will then send you a reminder at 6-month intervals to ensure that the filters are replaced. The Distributor, who will carry out this work for you, will at the same time check that the system is functioning correctly and will carry out all appropriate servicing. Reverse Osmosis System Installation, Pure Drinking Water. an adaptation of nature’s biological process. In the reverse osmosis process water is forced through a semi-permeable membrane that separates out the impurities and rejects them to the household drainage system. The R.O. membrane deals equally with bacteriological, chemical, organic and non-organic contamination. It will remove up to 98% of all pollutants. In humans, fluids pass in and out of such membranes (cell tissues) by the phenomenon known as osmosis, while plants absorb food and moisture from soil in the same way. 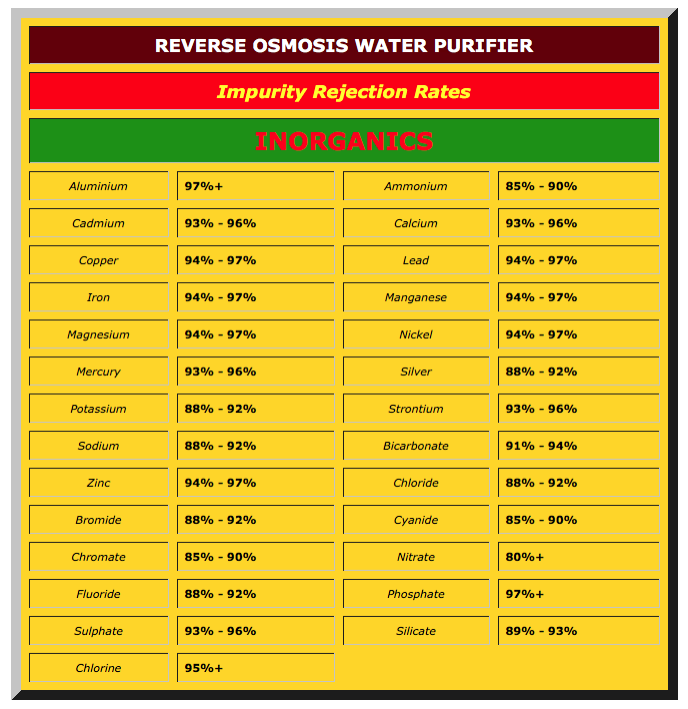 Reverse osmosis is simply this natural process turned around.